It’s a good thing that when the dogs look this angry, they’re just playing and not trying to actually kill each other! The beagle was only a couple of months old; our other dog was about 8 months older. Bark Magazine had a great article about this recently. The author discussed how dogs use play to communicate, develop relationships, and communicate with each other. There’s no sure way to tell if it’s appropriate or not, especially since dogs who are familiar and comfortable with each other may play much rougher. It’s also not always fair or symmetrical, but that doesn’t mean it needs to be stopped. Seldom does rough play translate into an actual dogfight. I find with my own dogs that there’s a lot of noise, but not a lot of actual action. Every now and then we get a squeal, especially if the miniature pinscher is being used as a toy without batteries. He makes a great rabbit on the race track around the family room and through the kitchen. The cats were big on noise and action. The screaming was often followed by launching at each other, violently ripping at throats, kicking, and lot of jaw action. Sometimes we’d see a cat later with skidmarks on their ears or a tuft of fur on the ground (or hanging from someone’s lip), but that didn’t happen very often. And it never stopped them from being best of buddies when it was naptime. There was only one trip to the vet for all the rough play and that was when an eye got scratched. Word for tomorrow – HUSH. If you prefer to work ahead, see the list for the week under “A Word A Day”. They have to determine who is going to lead, and who is going to follow. Only one Alpha dog allowed in their world. I don’t remember our cats being rowdy with each other, except when they were kittens. That was fun to watch. I love watching the animals play. 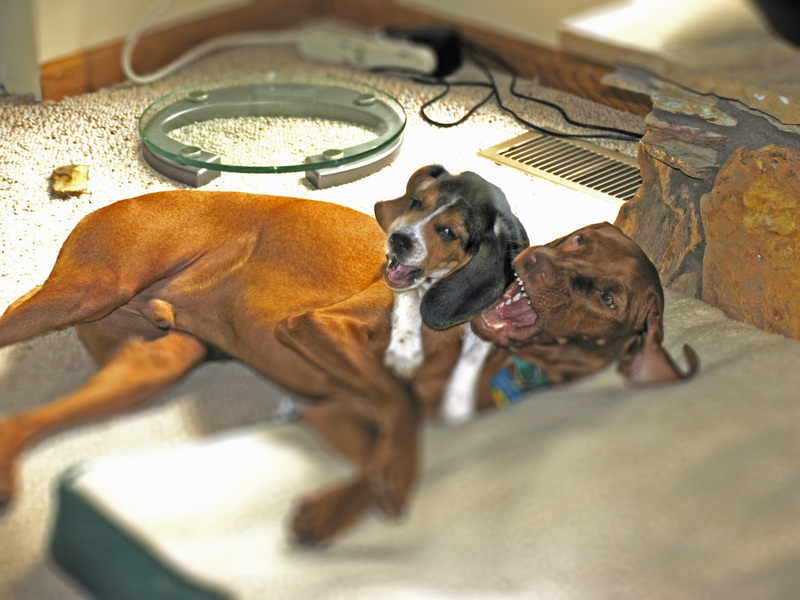 I also have a pair of baby Vizsla’s at play when our dog and our daughter’s dog were both puppies – lots of teeth and snapping jaws. I bet she was. I should have done a slide show – there was a pretty good sequence of those. I took a bunch of them because the dogs were moving so fast. Thankfully I got a pretty good sequence out of it.